When evaluating a heating system, you often look at the initial capital costs, and if you can get it – running or operating costs. That’s only natural. You want to know that you can afford the system now and in the future. You’re trying to estimate the Total Cost of Ownership and that’s good. But did you know that there are other hidden costs? Costs that are very much a part of owning and operating the system but aren’t immediately apparent when assessing them? In this article I will itemize some of these very real costs that aren’t immediately apparent to the casual observer. This is probably the most over-looked cost of them all, and it’s a biggie! Think about it for a minute: How much does your home or building cost per square foot? $100? $125? $200? The cost of the home varies greatly on the location and the details of how it is constructed and finished. So let’s take $100 per square foot as a base line. Now most mechanical heating systems require floor space. Some units take up more space than others depending upon the unit’s design. You can also factor in not just the foot print, but the safety space all around the unit. You can’t usually store anything immediately around the unit, so that floor space is lost to you. Let’s say it’s only 20 square feet. But at only $100 per square foot, that comes to $2,000! Congratulations! You just spent $2,000 (or more) just for a place to park your heating system! If you factor in the interest cost on the mortgage for this space it really starts to add up quickly. Wouldn’t you rather have that space available to you for more productive uses? A bigger Family Room or Rec Room, perhaps? A SmartRoom system, since it doesn’t take up floor space, allows you to maximize your investment in your home or building. Oh… and if your building is a commercial property that you rent or lease out, think how the additional space affects your bottom line: there’s more square footage available as rentable space. That’s more revenue year after year after year. 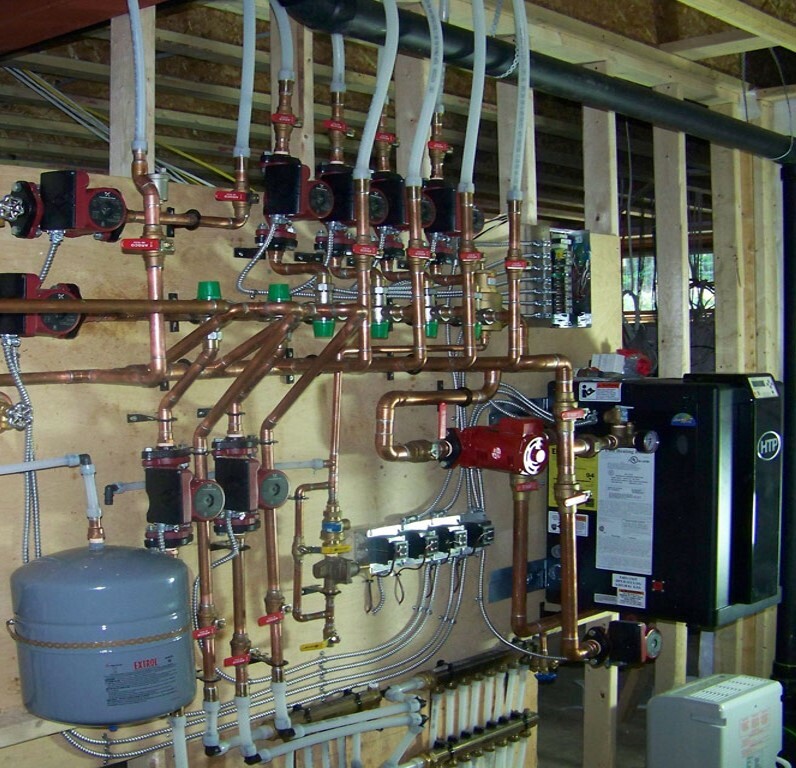 Mechanical system, such as heat pumps, furnaces and boilers all have parts subject to regular maintenance. The burner might need adjusting, belts replaced, fans oiled and cleaned. These aren’t normally large costs, but they do recur every year. (Or if you opt not to do these things, your system will run less efficiently.) Then there’s the inconvenience factor of having to book a day off for the technician to arrive. And that’s assuming he arrives on the day promised. At any rate, these costs do add up over the life of the system and you’ll want to include them when assessing your options. I’ve given Replacement Parts their own category as it is a separate issue from Regular Maintenance. These are usually bigger ticket items and are required to be purchased after the warranty runs out. They include pumps, compressors, fans, burners, etc. They’re infrequent (usually) but they can be costly. A new heat exchanger doesn’t come cheap, nor does the labor costs to diagnose and replace it. Watch those warranties carefully – sometimes you’ll hear a number quoted but you need to dig deeper. Does it cover the whole system or just certain parts of the system – like the casing, but not the burner, compressor or pumps. I’ve run across systems that would only guarantee the pump for 90 days! That’s a critical component. If a manufacturer isn’t going to back up his product, what are you really getting? Remember too, that most mechanical systems (especially in residences) are an all-or-nothing deal. There’s no redundancy. You have to create your own backup plan such as a wood-burning stove or the like. If your furnace or heat pump fails it usually affects the whole building. In larger commercial buildings, they’ll often look at redundant systems each often sized for a share of the total load. Should one fail, at least there’s a backup they can use or switch around from area to area. This only gives them 1/2 capacity, but 1/2 is better than nothing, right? But if you only have the single unit, you’re subject to 100% loss of the system. You don’t want that. We spoke recently with an owner of a heat pump. He mentioned that although his heat pump was less than 5 years old, his compressor failed which required new parts. He had been waiting several days at that point for the parts. Meanwhile he had no functional system. If this happens during the dead of winter you’re going to be scrambling for a backup system (multiple space heaters or whatever you can get your hands on) to prevent a catastrophe such as freezing pipes. Incidentally, while this owner’s parts were covered under warranty, the service call wasn’t, so he was going to have to fork out a sizable service fee, plus take a 1/2 day off work to allow the technician in to do the job. That’s a cost he never calculated in his original assessment. You should. A SmartRoom system generally comprises of several panels per zone. And several zones per home or building. Should a panel fail (normally it would have to be damaged somehow for that to happen), there are other panels within that zone to take up the slack. Should the zone fail (and really, the only way that could happen is if the wiring was cut, a thermostat failed or a circuit breaker failed – all easy repairs with readily available parts) it would only affect that zone. A single room. The rest of the house or building is unaffected. Insurance companies base their premiums on the perceived risks involved. Electrically operated heating systems (and especially SmartRooms) are generally considered to be safer sources of heat. Gas and oil systems are riskier. Gas is explosive and can do incredible damage to your home or building and to your neighbors’ homes and buildings. A quick Google for “natural gas explosions” will reveal just how frequent an occurrence it really is. On top of the explosion risk, natural gas is poisonous. That’s why it’s a good thing to have a detectors installed (at additional cost). Both oil and gas systems can leak carbon monoxide into your home or building. It’s created by the burning of the fuel. Most of it is supposed to be exhausted out of a chimney or vent (and there’s still a risk that it can be drawn back into the house anyway). If, however, there’s a crack in the seals this orderless and colorless poison can leak into your home or building. You can’t detect it without additional equipment. But it can be fatal. You can find out more about this here. Oil also has a storage problem. We’re seeing it more and more. In some jurisdictions you are no longer permitted to store an oil tank outside. Should it leak, the oil seeps into the ground and has to be cleaned up using expensive methods. We’ve heard of a case where such a leak cost the homeowner $45,000! So these jurisdictions are requiring, by code, that the storage tank be installed inside the home (taking up yet more of your valuable floor space). If the oil leaks, it’s safely contained in your home. How nice! On top of that, these same jurisdictions often require a specially constructed room designed to contain the oil and furnace. Again, another hidden cost. While this may make perfectly good sense to the bureaucrats implementing these policies, you’re the one that has to foot the bill. Is this really what you want? Are you even aware of these issues when you’re making your choice? Of course, not all jurisdictions have these regulations in place. But more and more are contemplating them from what I can see. At least that seems to be the trend. Those are some of the risks. Your insurance company knows them and factors them into your premium or writes in a clause that excludes these issues from coverage. Each insurance company is different. Some do offer lower premiums if you have a safer system. Some don’t. But unless you know to look, you’ll never know about it. I’ve highlighted just a few of the major hidden costs associated with mechanical systems. Many of them are pretty obvious once you think about it for a bit. A SmartRoom system isn’t subject to these kinds of costs. For the record, my own home, outfitted with our electric radiant heating products, has had a total of zero maintenance costs since it was installed in 2000. I just set the temperature and forget about it. Isn’t this what you want in a heating system?